Sunday night I had been informed by Team Ramrod (housemates of my other half) that they would like me to cook dinner. Rob had asked that I cook meat, seeing as my blog at this point lacked a meat dish or two. I took on the challenge, racked my brain, and remembered a recipe from Donna Hay's book Seasons for Garlic and Mustard Beef Skewers. The recipe called for aioli to go with the dish, but I didn't feel this was right, so instead made Tzatziki. Great combo! 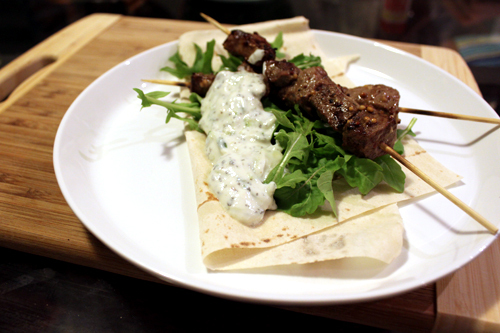 The balance of the bread, beef, rocket and Tzatziki was a perfect fit. I was lucky enough to have the skewers cooked on the barbeque grill, so they were smoky and char grilled. With them, we cooked some sweet potato chucky chips. I have made a couple of changes to the recipe seeing as I served 5 people the other night and doubled the recipe, hoping to have some left overs for work the next day, only to find it was all demolished. You can find the original recipe here. On a side note, I have come to the conclusion that Donna Hay makes perfect summer dishes, and I think this might have to do with her being an Australian. I have had one of her books for a couple of years but only referred to it a handful of times. When it comes to winter cooking however, I find myself head deep into books by Jamie Oliver, Nigella Lawson and Neil Perry. Oliver is particularly is brilliant at winter foods, and I think this comes from being an English man. So when Perth stops becoming sauna, I am interested to see where my next inspiration of food comes from! In a bowl, combine the steak, garlic, olive oil, vinegar and mustard and toss well. Cover and refrigerate for at least 30 minutes. Thread the steak onto skewers. Heat a large pan or barbecue to a high heat. Cook the skewers for a couple of minutes each side, or until cooked to your liking. Serve with the mountain bread, rocked leaves and aioli (or tzatziki). Serves 4. Beef skewers can be added with mustard for a unique taste.